The storage core-feature-set is stable and safe as of the beta release, with all of the present issues being GUI and feature related. All essentia transport operations have a double check buffer that first simulates the operation, verifies the expected amounts in both source and destination, performs the operation, and again verifies amounts. If any of these checks fail the state of both source and destination are reverted to their pre-operation values. Great - thanks for the quick response. This looks amazing! I'll try it out later. No, mine are not showing up! Well as it turns out they only work with a dev build. I centralized all of the tooltip code and was using reflection to access some functions, completely forgetting that their names would be obfuscated. Time for a rewrite lol. Version 0.6.5b has been released. Could the essentia storage bus use the "void" properties of void jars? Trying to use void jar to keep an essentia type out of my essentia storage cells, but keep a stack or so of it handy in the system. Added to the ToDo list. The plan is to add a button to the GUI to allow/disable void mode, that way you have the flexibility to turn it on or off as you need too. Having an odd issue; the thaumic energistics stuff is there and it all works. But on my server, the output is invisible. I can pick it up just fine, but it doesn't show up until after I have. Edit: My bad, the output of the crafting table and of the Arcane workbench are invisible. I'm not sure what to make of it, as it does apparently work just fine, it just looks odd. Also, it doesn't show what the formula requires for the crafting as far as vis goes. 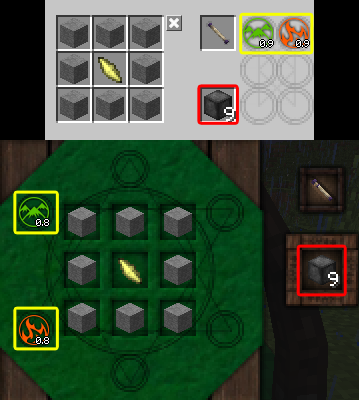 So in both the Arcane Workbench from TC and the Arcane Crafting Terminal from my mod, the crafting result(Outlined in red) along withe the required vis icons(Outlined in yellow) don't show up? Edit: If I read your post correctly, this is also happening with vanilla crafting tables? The below crash is what I get when I try and go into ANY research from your mod or the main mod or any other add-ons I have that add stuff to TC4. The trick however is that it only happens when i have your mod installed. I pray there is a way to make this work without removing one of the other add-ons as I am kinda greedy and I want them all. The below crash is what I get when I try and go into ANY research from your mod or the main mod or any other add-ons I have that add stuff to TC4. The trick however is that it only happens when i have your mod installed. According to the conversation from https://github.com/Azanor/thaumcraft/issues/1095 the issue is related to using an incompatible forge version. They suggest that rolling forge back to version 1208. If I understand correctly, the issue deals with the Thauminomicon asking forge for information about an item. All of my items use forge calls and hooks to relay data into other mods, so it I can understand why my mod would be causing trouble if those forge functions are not present in other forge versions. Try using 1208 and see if it still gives you issues. Works now, thanks for the quick response. So no updating to above 1208 for me then. Yup, the cutting edge versions of forge have changes some of their method signatures, so mods that have been built against 1208, such as TC and my mod, will likely not work properly. Once the next version gets promoted and declared stable, we mod developers can start building against it. I nearly went and made a crash report on the thread, then I read the FAQ. Thank. God. Version 0.6.6b has been released. Added void mode to Essentia Storage Bus, with a known issue. I'm not sure if I cam getting the same crash for the same reasons as the guy a couple posts above me, but when I added this very useful sounding mod I get this crash. I checked Applied Energetics and I am using the most up to date stable, do I need a newer unstable version? Thanks! So I didn't necessarily feel this should be an issue on Github, or even if this is a major issue or anything. However I noticed that the Arcane Workbench Terminal is only placeable on Dense Cable in AE2, along with it also appearing backwards. The green faces the cable, while the back faces out. It works okay, just faces the wrong way. I'll post a screenshot when I can, unless it's already been brought up and all.